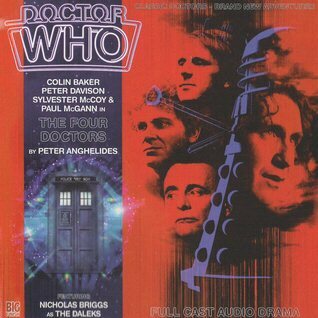 "The Fifth Doctor investigates the Vault of Stellar Curios, where he has observed evidence of time leakage. But then the Daleks attack, looking for the contents of the mysterious vault. The Eighth Doctor also shows up and he and his former self create a time loop trap, spanning between their lives. This sends the Daleks to the Seventh Doctor's encounter with Michael Faraday in 1854 and the Sixth Doctor's visit to an early Dalek battlefield." This is available as a bonus when you buy a one year subscription to Big Finish. What did you think? Which Doctor stood out as the best of the bunch? Was the story worthy of all of them needing to be there? This one was a super-quick listen, very fun though. Had some very timey-wimey stuff to it that made it really fun. I always like having several of the Doctors sort of converge into one story, it's so fun seeing how they all interact! Like I said, it was a quick listen, but I almost would have liked something like this to have a stronger plot that was longer. Oh well, still a fun listen for a Sunday afternoon. On one hand I like how it played with the Doctors' timelines by having the story jump around but on the other hand I really didn't. It was often very confusing and it took me a bit to even figure out what kind of story it was trying to tell. Also this felt like another wasted opportunity. With the TV show, the only Doctor we see is the current one. With Big Finish, these four are on constant rotation. There is a new Fifth Doctor story every few months. So having them back isn't a big appeal, it's them interacting. Sadly there was just a minimal amount of that. Oh well.